The key to every successful business has to do with creating, developing, and dominating new categories of products and services. The founders of a respected Silicon Valley advisory firm study legendary category-creating companies and reveal a groundbreaking discipline called category design. Winning today isn’t about beating the competition at the old game. It’s about inventing a whole new game—defining a new market category, developing it, and dominating it over time. You can’t build a legendary company without building a legendary category. If you think that having the best product is all it takes to win, you’re going to lose. In this farsighted, pioneering guide, the founders of Silicon Valley advisory firm Play Bigger rely on data analysis and interviews to understand the inner workings of “category kings”— companies such as Amazon, Salesforce, Uber, and IKEA—that give us new ways of living, thinking or doing business, often solving problems we didn’t know we had. In Play Bigger, the authors assemble their findings to introduce the new discipline of category design. By applying category design, companies can create new demand where none existed, conditioning customers’ brains so they change their expectations and buying habits. While this discipline defines the tech industry, it applies to every kind of industry and even to personal careers. Crossing the Chasm revolutionized how we think about new products in an existing market. The Innovator’s Dilemma taught us about disrupting an aging market. 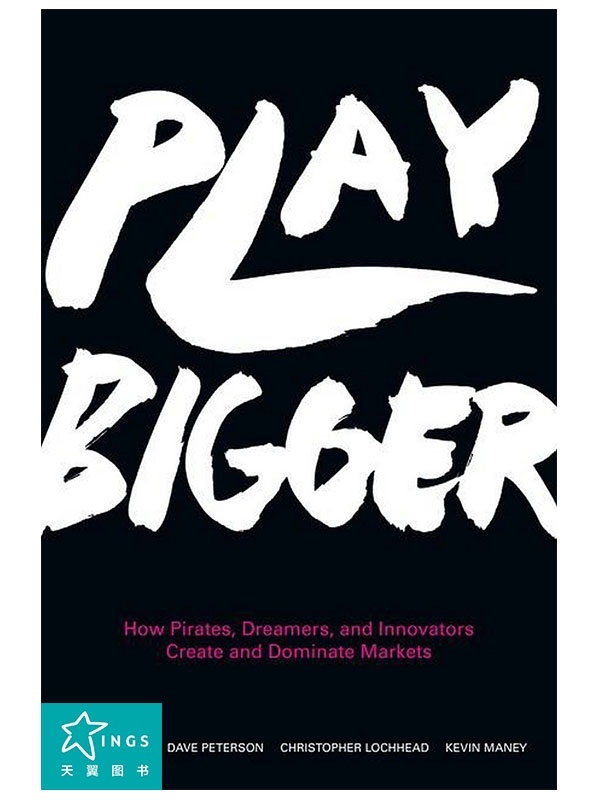 Now, Play Bigger is transforming business once again, showing us how to create the market itself. Al Ramadan is a co-founding partner of Play Bigger Advisors. Al co-founded Quokka Sports, which revolutionized the way people experience sport online. He then joined Macromedia and Adobe, where he spent almost ten years changing the way people think about great digital experiences. At Adobe, Al led teams that created the Rich Internet Applications category and helped develop the discipline of experience design. In the early ‘90s he applied data science to Australia’s Americas Cup -- an innovation in sports performance analytics. His work in sailing led directly to the idea for Quokka. He lives in Santa Cruz, Calif.
Dave Peterson is a co-founding partner of Play Bigger Advisors. Dave has been an entrepreneur, chief marketing officer, master of execution, and fixer of crappy marketing. He grew up in Iowa, and later moved to Silicon Valley, landing at CRM software company Vantive. He worked as head of communications at Mercury Interactive, and as CMO at Aggregate Knowledge and Coverity. He co-founded and shut down GiveMeTalk! a podcasting pioneer. Dave (apparently) loves crashing his mountain bike, avoiding trees on his snowboard, traveling to non-predictable places with his friends, and learning new things from his daughter. He lives in San Francisco. Christopher Lochhead is a co-founding partner of Play Bigger Advisors. Christopher is a CEO marketing coach and category designer, keynote speaker, mediocre blogger, ski and surf bum. He has been called a "Human Exclamation Point" by Fast Company and "slightly off-putting" by The Economist. Christopher served as CMO of Mercury Interactive, co-founded marketing consulting firm LOCHHEAD, was the founding CMO of Scient, and served as head of marketing at Vantive. He is living happily ever after in Santa Cruz, Calif.
Kevin Maney is a best-selling author and award-winning columnist for Newsweek. Kevin co-authored, with TIBCO CEO Vivek Ranadive, The Two-Second Advantage: How We Succeed by Anticipating the Future...Just Enough. It was a 2011 New York Times bestseller. Kevin also wrote the critically-praised biography, The Maverick and His Machine: Thomas Watson Sr. and the Making of IBM. His first book was 1995’s Megamedia Shakeout, one of the earliest books about all media going digital. Kevin has written for USA Today, Conde Nast Portfolio, Fortune, The Atlantic, and Wired, and has often appeared on radio and television. He lives in New York.